In 2016, one of those clouds became Minefield,  Arias’ piercingly brilliant exploration of the lasting psychological impact of the Falklands/Malvinas War on veterans from both sides. The production, which mixes in archive footage and a live band, was forged in collaboration with ex-Argentinian and British soldiers. They are also its onstage performers. After premiering at last year’s Brighton Festival, Minefield embarked on a tour that began with a nine-day run at London’s Royal Court Theatre. Now, it’s gearing up for a return to the new-writing venue in Sloane Square, as part of its autumn season. Arias lives in Buenos Aires. 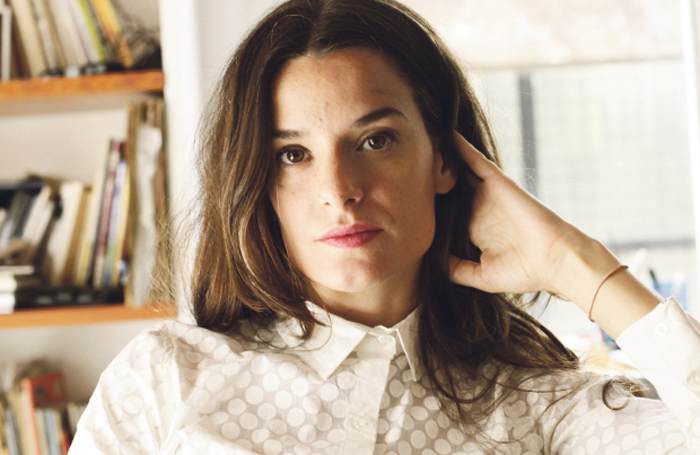 She is co-founder of Compania Postnuclear, an Argentinian collective of artists with broad-ranging interests. Her work, which frequently puts non-actors front and centre, and weaves multimedia into its storytelling, was well known at home and throughout Europe before Minefield. British theatre wasn’t a big influence on Arias as a younger writer and theatremaker. “I was more inspired by the work that people were doing in Germany or the Netherlands – things that had nothing to do with traditional narratives or actors,” she says. Minefield wasn’t Arias’ first show staged in the UK. 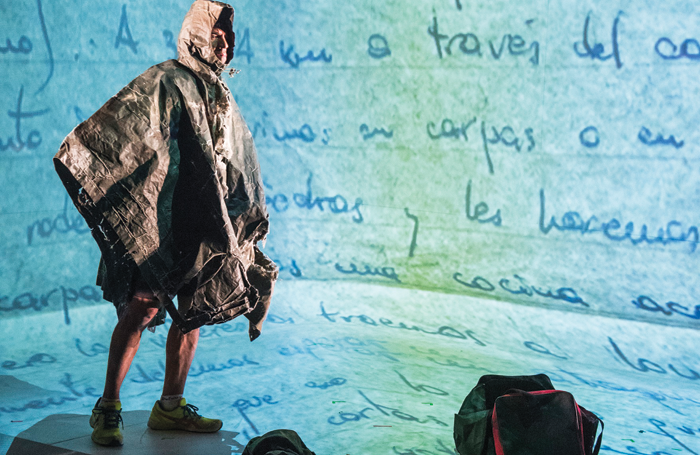 My Life After  and The Year I Was Born – created in collaboration with people whose parents had lived under the Argentinian and Chilean dictatorships – won rave notices at the Brighton Festival and London International Festival of Theatre in 2013 and 2014 respectively. However, Arias feels that Minefield was “the first time the British audience opened up to my work”. She acknowledges that the previous pieces had got “nice reviews in the Guardian”, but they hadn’t been part of a theatre’s season or stayed for two weeks on stage. “Minefield had a bigger impact,” she says. Arias welcomes this new relationship with British audiences and with the Royal Court, where she undertook a writers’ residency in her early 20s. She relished bringing Minefield “into this beautiful theatre in the poshest area of London, with a group of non-professionals and surtitles”. Minefield was a success. Initially, though, it was a difficult project to get organisations to commit to. Arias encountered institutional wariness about the show in Argentina and in the UK. “They were afraid of its political meaning and that I was going to say that the Falklands belonged to the British or the Argentinians,” she says. What was your first professional theatre job? I wrote and directed a piece called La Escualida Familia in 2001. What was your first non-theatre job? My first paid job was a survey for a soap brand. Then I did all kinds of teaching (Spanish, literature, acting, writing). What’s your next job? I’m doing a play with the Open Border Ensemble, a group of Syrian actors, at the Kammerspiele, Munich. What do you wish someone had told you when you were starting out? If you are a woman and a director, don’t get depressed if the men in the theatre think you are not good enough. And work together with other women, we are good at multitasking. Who or what is your biggest influence? My three-year-old son. What’s your best advice for auditions? Don’t go. If you hadn’t been a theatremaker, what would you have done? I would have liked to be a pop star. The next year, Ball asked Arias and other artists from around the world to contribute to After a War, LIFT’s response to the centenary of the First World War in 2014. Arias chose to work with veterans from the Falklands conflict, as Argentina’s only 20th-century war. The result was Veterans, a video installation in which five Argentinian ex-soldiers re-enacted memories of the Falklands War at home and at work. As Arias showed these men’s stories as part of LIFT at Battersea Arts Centre, she found herself asking: what happened to the other side? For Arias, theatre should be “an encounter between people”. Minefield doesn’t try to gloss over its process. The conflicts that sometimes arose between Arias and her non-actor cast members – grappling with their past and their role in the project – are built into its identity. Exploring that tension on stage, looking at the sometimes-painful process of how people arrive at the stories they tell about themselves and others, is a common theme throughout Arias’ work. There’s a fascination with the role of time and memory. You could try to describe Arias’ work as ‘verbatim’, but it’s a term she hadn’t even encountered before British journalists started bringing it up. She finds what she sees as its connotations of theatremaking as ‘editing’ misleading. “Every word is as worked on as any of my poetry or short fiction,” she states. Arias feels the responsibility of working with real people’s lives and emotions in this way. With My Life After, “we had a lot of discussions with the performers about how we were representing the generation that fought in the guerrillas movement against the dictatorship”, she says. Shows like Minefield and My Life After are also social experiments, Arias adds. They are “living, breathing creatures” designed to evolve between runs, as performers’ perceptions of events begin to change through talking about or re-enacting them on stage. Minefield in 2017 is not exactly the same as last year, says Arias, “because the past is not something fixed”.